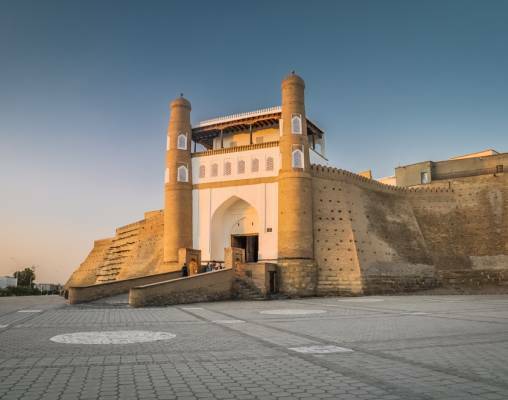 Travelling along the Silk Road through the ancient land of Persia, this unique journey between Tehran and Moscow takes in destinations that are rarely experienced by the Western visitor, which makes it all the more special. Upon arrival into Tehran you will be met and transferred to the Espinas International Hotel (or similar) for a two-night stay. On the first evening we will enjoy a welcome reception dinner, whilst you meet your fellow travelers on this highly anticipated journey. Our first port of call on our city tour of Tehran is the Crown Jewels Museum in the Central Bank of Iran Building, with its vast array of crown jewels used by the Qajar and Pahlavid royalty and the legendary Peacock Throne. Also we visit the Golestan Palace with its renovated Versailles-inspired mirror-encrusted Marble Throne Hall used for the coronation of the last Shah. Most of the remaining brick and tile buildings date back to the 19th century Qajar dynasty. Late afternoon on Day 3 we transfer to the main railway station in the city and board the Golden Eagle. Settle in to your cabin and later enjoy dinner as the train heads overnight to Sha'adat Shara for our first stop at Persepolis. Following breakfast on board we stop at Sha'adat Shara, for the home of Persepolis, a World Heritage Site. 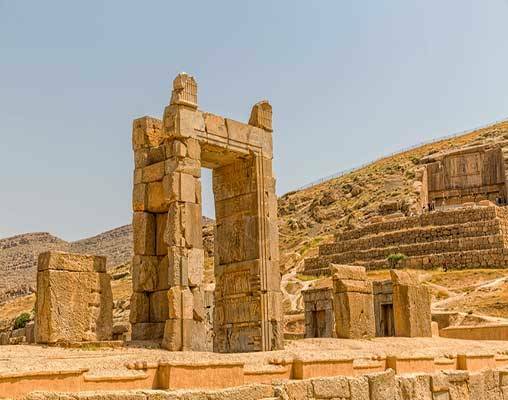 Perhaps Iran’s most important archaeological site, this ceremonial capital of the Persian Empire dates back to the 6th century. Even now, the ruins are extremely impressive. We also view the Necropolis (Naghshe Rustam). After lunch we continue by bus to Shiraz. 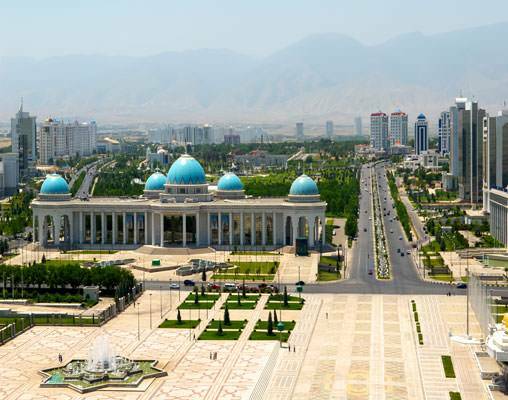 Shiraz has many strings to its bow: poetry, literature, wine, flowers and amazing gardens and fruit trees. A visit to the Quran Gate, Hafez Tomb and the Vakil Citadel are the highlights of our afternoon tour. 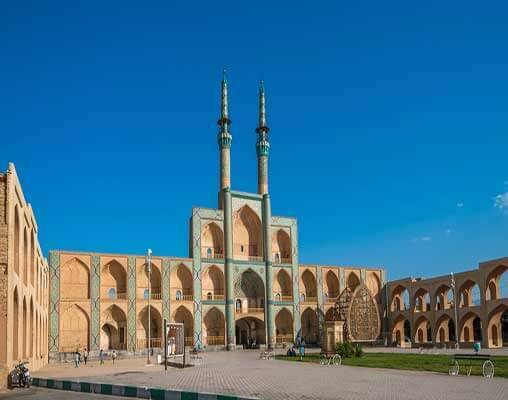 Yazd is thought to be one of the oldest cities in the world and a center of Zoroastrianism, a monotheistic faith founded in Iran 3,500 years ago. Our tour takes in the Zoroastrian Fire Temple, Amir Chakhmagh Square and the 14th century Friday Mosque, home to one of Persia’s finest and exquisite mosaics. After breakfast we alight in Rayen. The 20,000 square meter Rayen Castle is situated beneath the snow-capped Mount Hezar in the Province of Kerman. A huge medieval mud brick citadel, it was considered second only to Bam before the 2003 earthquake. Rayen displays all the architectural elements of a deserted citadel (it was inhabited until 150 years ago) and is extremely well preserved. It is considered one of the most interesting sites in Iran. We continue by road to Mahan where we visit the 19th century Royal building, Prince's Garden and tomb. We later visit the sanctuary and tomb of the famous, Soufi, Shah Nematollah Vali, dating back to the Mongol Era. An early morning arrival provides us with the whole day to explore the city of Mashhad, which is home to the Imam Reza Holy Shrine, the largest mosque in the world in terms of its dimension, followed by a tour of the Nader Shah Museum. 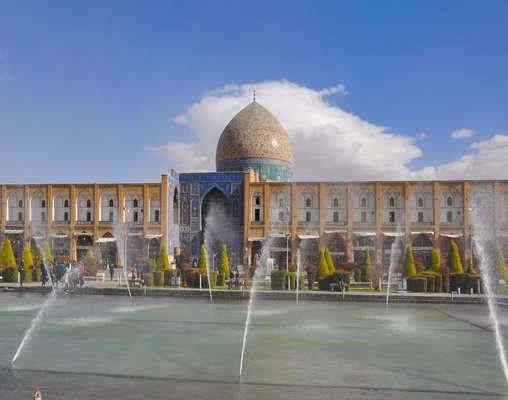 Following lunch in the city, we will visit the Tomb of Ferdowsi, the father of Persian Literature who lived over 1,000 years ago. We stay overnight in Masshad as the Golden Eagle travels onto Sarakhs as we make important changes to the wheel sets of the train. We arrive at the border town of Sarakhs by coach and we make the short visit to the excavation site of the old Sarakhs Citadel and Mausoleum of Abul Fazl. We later re-join the Golden Eagle and continue our journey into Turkmenistan. The Golden Eagle makes a brief scheduled stop at Ichoguz, where we have the option to leave the train and make a short journey to Darvaza’s famous burning gas crater, a spectacular sight best seen at night. 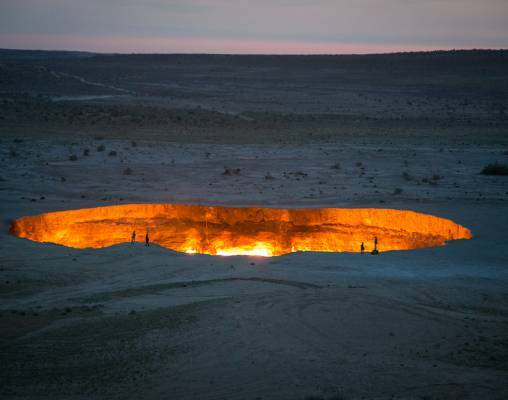 Located in the middle of the Kara Kum desert where the area is rich in natural gas, the 70 meter-wide crater is known by the locals as the ‘Door to Hell’ and has been burning for over 40 years. A unique experience that is not to be missed. Baikonur, formerly known as Leninsk, is situated on the right bank of the Syr Darya River and was constructed to service the Baikonur Cosmodrome, which itself was originally constructed by the Soviet Union in the late 1950s as the base of operations for its space program. This is a place filled with so much history from the launch of Sputnik 1 in 1957 and the launch of the first human, Yuri Gagarin, into space in 1961 to the current day missions to re-supply the International Space Station. On our visit to Baikonur we will visit the launch station of Yuri Gagarin’s mission into space. Today, we enjoy a relaxing day on board as we travel across the vast open expanses of Kazakhstan and southern Russia. As well as experiencing the unique landscape, you can take the opportunity to chat to fellow passengers and maybe take part in a Russian language lesson. 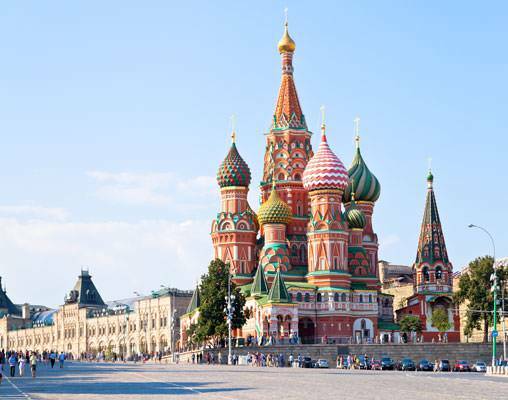 Our afternoon touring program of Moscow principally takes us to the grandeur of the Kremlin – the spiritual, historical and political heart of Moscow – and to see the treasures of the Tsars in the Armoury Chamber. We also visit Red Square, an iconic symbol of Russia’s former military and political might with its eclectic mix of fascinating architecture, such as the ornate St Basil’s Cathedral’s magnificent onion-domed spires, the beautiful facade of the world famous GUM department store, constructed in Tsarist times, and the somber and evocative site of Lenin’s tomb. Enter your details below if you would like to be notified when 2020 dates and prices are available for The Golden Eagle - Persian Odyssey. Prices are land-only, per person based on double occupancy. Prices are correct at the time of this web page going live; however are subject to confirmation at time of booking. Northbound journey is also available. Please call a rail specialist for details Itinerary may vary for 2019 departures.